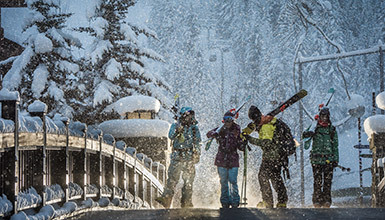 Whistler has things to do for both skiers and non-skiers – use our guide to winter activities to plan your vacation, whether you want to ski Whistler Blackcomb, try outdoor adventures, discover the delights of Whistler Village or simply relax and enjoy a true winter wonderland. Winter is so incredible it’s hard to capture it in one itinerary - but we're up for the challenge. 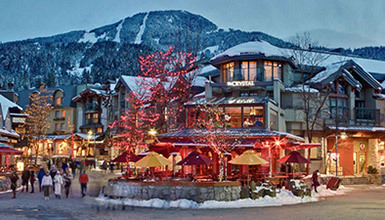 Here's a list of signature experiences and iconic activities, pure Whistler winter culture with a Canadian twist. Want to see the true magic of winter? Take some quality time with the kids. Here are our top suggestions for things to do with the family, providing plenty of options to help you plan. With daily flights to Vancouver, rapid airport transfers and a walk-everywhere village, getting here and getting around is simple. 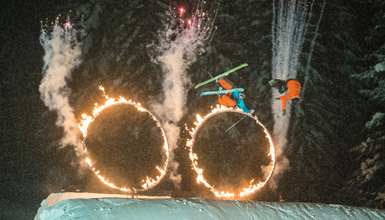 Every Sunday during winter, skiers and riders jump through hoops of fire in a spectacular outdoor evening show that's free!